Non-Smoker vehicle, Excellent Service History, CARFAX 1-Owner, Excellent Condition, GREAT MILES 43,421! WAS $26,990. SIRIUS SATELLITE RADIO, ALPINE PREMIUM AUDIO SYSTEM, Tow Hitch, Brake Actuated Limited Slip Differential, 4x4, BLACK 3-PIECE HARD TOP, CONNECTIVITY GROUP. 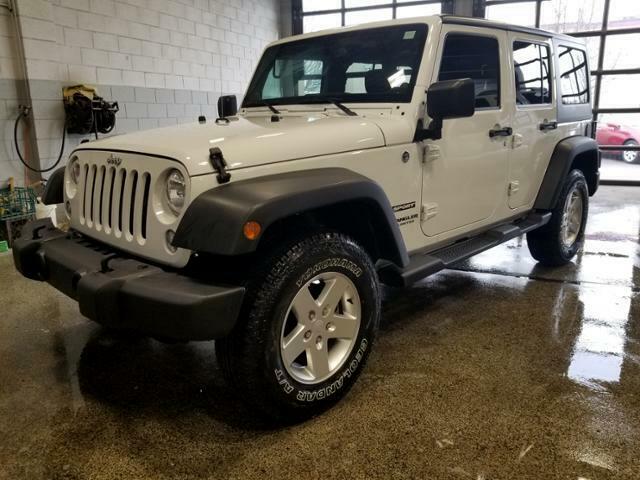 QUICK ORDER PACKAGE 24S Engine: 3.6L V6 24V VVT, Transmission: 5-Speed Automatic (W5A580), Deep Tint Sunscreen Windows, Leather Wrapped Steering Wheel, Chrome/Leather Wrapped Shift Knob, Tires: P255/75R17 OWL On/Off Road, Power Convenience Group, Front 1-Touch Down Power Windows, Remote Keyless Entry, Power Heated Mirrors, Power Locks, Security Alarm, Wheels: 17 x 7.5 Aluminum, Auto Dim Mirror w/Reading Lamp, TRANSMISSION: 5-SPEED AUTOMATIC (W5A580) Hill Descent Control, Tip Start, BLACK 3-PIECE HARD TOP Rear Window Defroster, Tinted Rear Quarter & Liftgate Windows, Delete Sunrider Soft Top, Freedom Panel Storage Bag, Rear Window Wiper/Washer, CONNECTIVITY GROUP Uconnect Voice Command w/Bluetooth, Vehicle Information Center, Remote USB Port, Tire Pressure Monitoring Display, TRAILER TOW GROUP Class II Receiver Hitch, Trailer Tow w/4-Pin Connector Wiring, SIRIUS SATELLITE RADIO, For More Info Call 888-539-7474, ENGINE: 3.6L V6 24V VVT (STD). . The 2014 Jeep Wrangler is a no-nonsense vehicle that's at its best when the pavement ends. This classic SUV will climb over rocks, cross streams and frolic in the sand dunes whenever you please, thanks to its standard four-wheel drive and high ground clearance. -Edmunds.com.